Please note that this is a DIY camera, not a commercial product. We have done our best to make the instructions easy to follow, but there are some fiddly steps and it may take some experimentation and tinkering to make things work. You can download the Daylight Camera Instructions as a printable booklet here. The parts you need to make the camera can be ordered from online retailers or bought in electronic hardware stores. Follow the links below to find out more about each part, some links lead to retailers but you may need to shop around to find the best deal for each part. Prices can vary considerably, but it should be possible to source a complete kit for around £35. * The cost of power banks vary enormously, so do shop around. In addition, the capacity of the battery depends on how long you wish to leave your camera running. Some users are happy with 2 or 3 hours of usage from a pound-shop battery, while others prefer that the battery lasts over a day - so finding the right balance may take some experimentation. ** Please Note: Some retailers supply micro SD cards in bundles the have an operating system called NOOBS preinstalled. This is not the right software for the cameras, and will be deleted automatically when you install the My Naturewatch Camera software on them (steps 1 -5 below). We have also had reports of issues using SD cards with capacities of 64GB and greater, so we recommend sticking to the 16 -32GB range. There are six stages to making a My Naturewatch Camera. Copy the camera software to a micro SD card (up to 1 hour). This software contains the operating system for the Pi Zero and an application that controls the camera. This bundled software is often referred to as a ‘disk image’. Downloading the software and installing it on the SD card can take a while, depending on things like the speed of your internet and the computer you’re using. You can skip to Step 6 and continue working through the ‘Assembly’ and ‘Housing’ sections while you wait for actions in steps 1-5 to complete if you like. Note: After Etcher has 'flashed the drive', Windows based computers will sometimes ask if you would like to format the SD card. If this happens, click 'no', otherwise the software will be deleted. * When using a micro SD adaptor, be sure that the copy protection switch is unlocked. If the connector breaks, you can hold still use hot glue or tape (not superglue) to hold the cable in place – but its best to be gentle and patient to avoid breakage. 8. In order to dissipate heat from the processor it is necessary to attach a heatsink. Raspberry Pi heatsinks generally have self-adhesive tape already applied. Peel away the protective layer of the tape and carefully stick the heatsink squarely over the large black chip on the Pi Zero. In a previous version of these instructions we suggested supergluing a bolt to the processor as a cheap alternative to a commercial heatsink, we have now changed this advice because we found that thermal performance varied considerably depending on the material of the bolt and users reported mixed results. The ribbon cable of the camera can easily detach from the PI Zero. We recommend mounting the camera and Pi Zero to a piece of card to protect the connection. 9. Use a stiff piece of card appropriate in size to the container you plan to house the camera. Click here for a printable outline drawing of the card used is these images, this shape is optimised for use with the Sistema Kip It 900ml cracker box. In this version, the camera and Pi Zero are mounted on opposite sides of the card. Use double-sided sticky pads to mount the Raspberry Pi to the card, here we have mounted it offset to the centre to allow space for the USB power lead. Carefully fold the camera cable ribbon cable at its narrowest point around the top of the card, remove the protective layer of the sticky tape that is factory mounted on the back of the camera, and stick to the other side on the card. A small piece of masking tape can also be used to secure the camera ribbon. Tip: If you plan to use a large container, the Raspberry Pi and camera can all be mounted to one side of a piece of card. The My Naturewatch Camera creates it's own wireless network allowing you to control it through a web browser on any smart phone, tablet or computer connected to it. Here you can change the name of this wireless network or if you are happy with a default name of 'MyNaturewatch' skip to step 13 . 10. View the contents of the micro SD Card on your computer by selecting 'boot'. 12. The name and password of your Camera can be edited by rewriting the appropriate lines which are by default ‘MyNaturewatch’ and ‘badgersandfoxes’ respectively. There is no requirement to change the default names, but the option is available to provide choice or for situations where there is an intention to run multiple cameras simultaneously. Please note that any new name password must contain at least eight characters of letters or numbers. Be sure to save the file if you make changes. Note: 'Connect to home network' is for a future feature. 13. Insert the micro SD card into the silver socket on the Pi Zero - the metal contacts on the SD Card should face toward the green board. 14. Power the assembled unit by connecting the USB power bank to the Pi Zero. The small end of the USB cable plugs into the ‘PWR’ port on the end of the Pi Zero closest to the camera. The large end of USB cable plugs into the USB battery (or any USB power source). 15. Allow 60 seconds for the Pi Zero to boot up. The green light on the Pi Zero will flicker to indicate processing. Once the system has started, a red LED on the camera ribbon cable will light. If the red LED does not light, it is likely that the camera ribbon cable is not correctly seated in the Pi Zero and so repeat step 7. 16. On a smartphone, tablet or computer connect to the camera's wireless network. 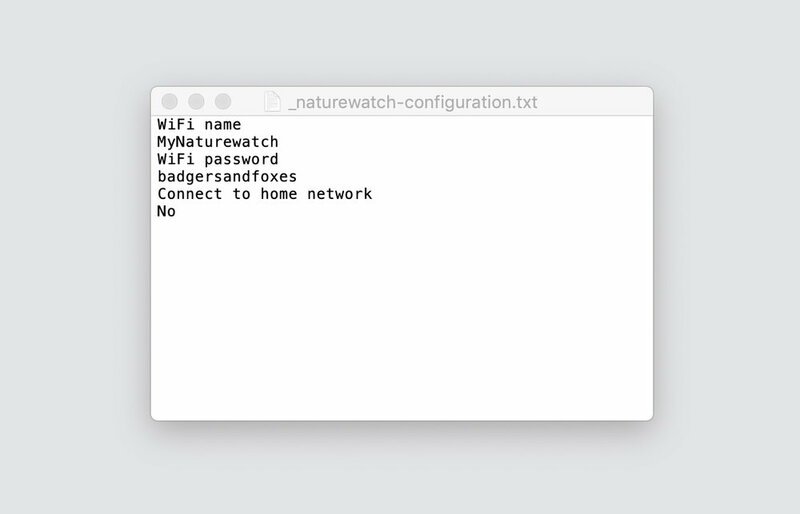 The wifi network name with either be 'MyNaturewatch' or the unique name you gave it in step 12. The wifi password will either be 'badgersandfoxes' or the unique name you gave it in step 12. You should see the live preview feed from your camera along with the following simple control buttons: Start Image Capture, Image Gallery and Settings. Find more information about the web interface in 'Using My Naturewatch Camera'. The camera works best if the lens is not behind the housing material, no matter how clear that may seem. We drill a hole in the main housing and use a rain cover to protect the lens. 18. Cut around a the top of a 2 litre plastic bottle with scissors to make a cover (always take care cutting plastic). 19. Make a hole in the side of a tall food storage box at a height that accommodates the camera lens. The hole should be about 10mm in diameter and is best made by starting with a small drill and progressively working up to the desired size in order to prevent the container from cracking. If you would like the lens cover to also be detachable, also drill an identically sized hole in the drinks bottle cap. This is best achieved by holding the cap firmly within the jaws of a suitably sized pair of pliers (always take care cutting plastic). 20. Position the drinks bottle cover (with or without the cap) over the opening in the food storage box and make a waterproof seal using a hot glue gun, Sugru or household sealant. 21. Tape the cardboard camera mount inside the container, with the lens positioned to look through the hole you drilled. Attach the battery pack. Tip: a pouch of silica gel will help any absorb moisture that collects in the container. 22. 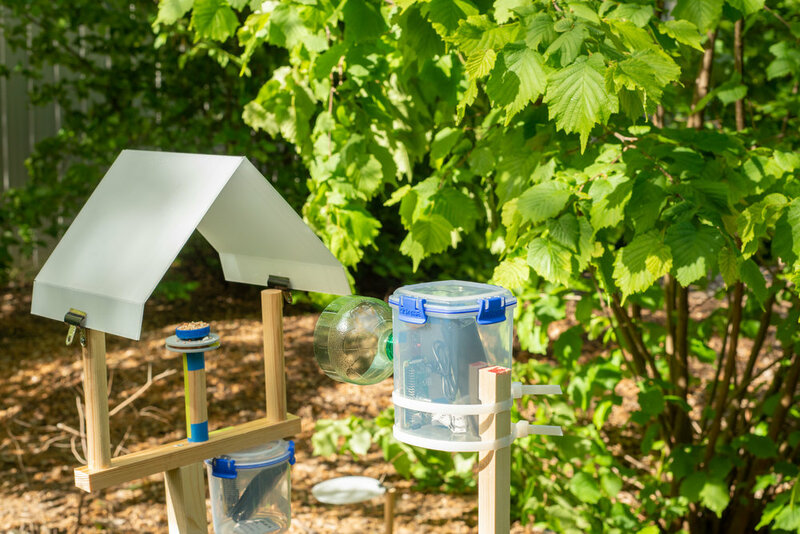 Seal the lid - you now have a weatherproof My Naturewatch Camera! ﻿23. Please go to the Using Your Camera page for instructions about how to set your camera up. Make sure to read through the steps above and do not forget to read the Using Your Camera page. Consider other people’s privacy when placing the camera. Connect to the Naturewatch camera to see what it sees and appropriately frame the image. Consider where’s best to place the Naturewatch camera. 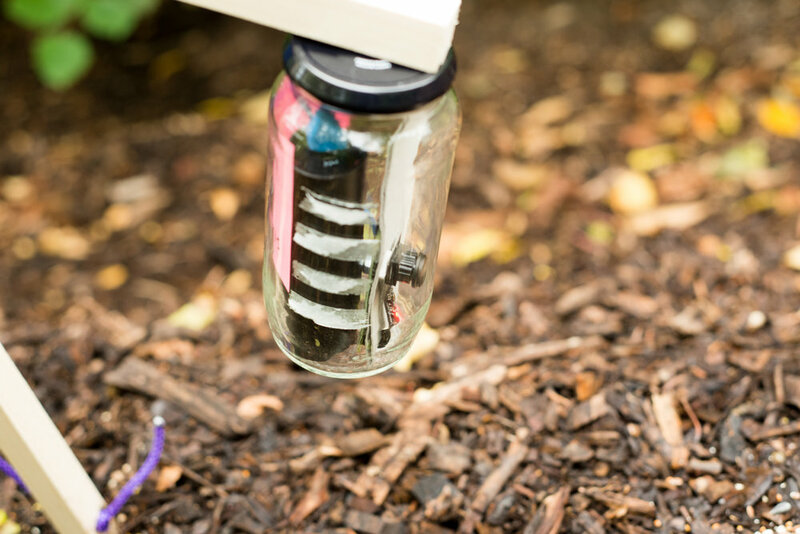 We advise deploying the camera on your own property, such as your garden or land that is owned or managed by you. Make sure to secure the Naturewatch Camera appropriately (weighing 200grams maximum). Do not touch / handle animals under any circumstances.